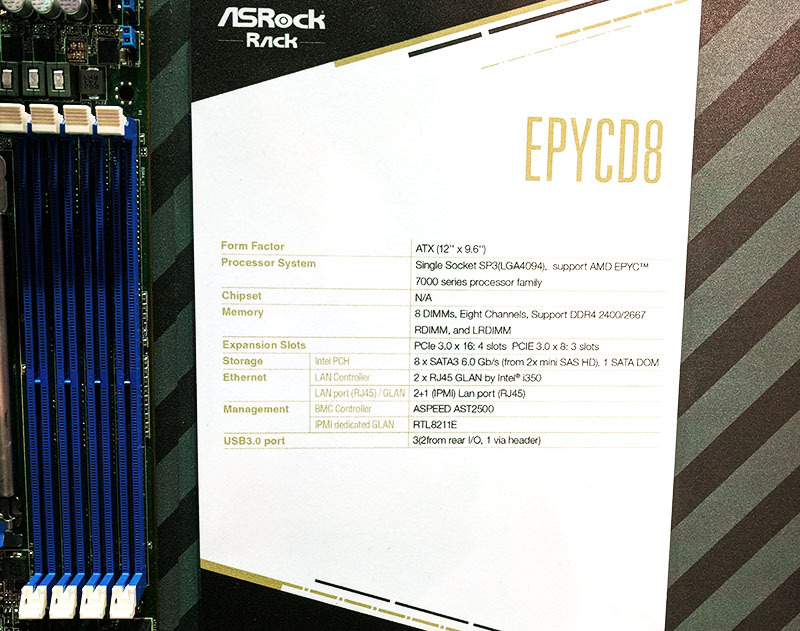 At Computex 2018 we spotted the ASRock Rack EPYCD8 which is the company’s first foray into single socket AMD EPYC. 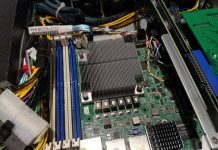 We think that ASRock Rack made some great design decisions with the EPYCD8 server platform. Notably, the platform supports an awesome amount of I/O in an ATX form factor which is a challenge given AMD Socket SP3 and the eight DDR4 DIMM slots required to fully populate AMD EPYC 7000 series memory controllers. 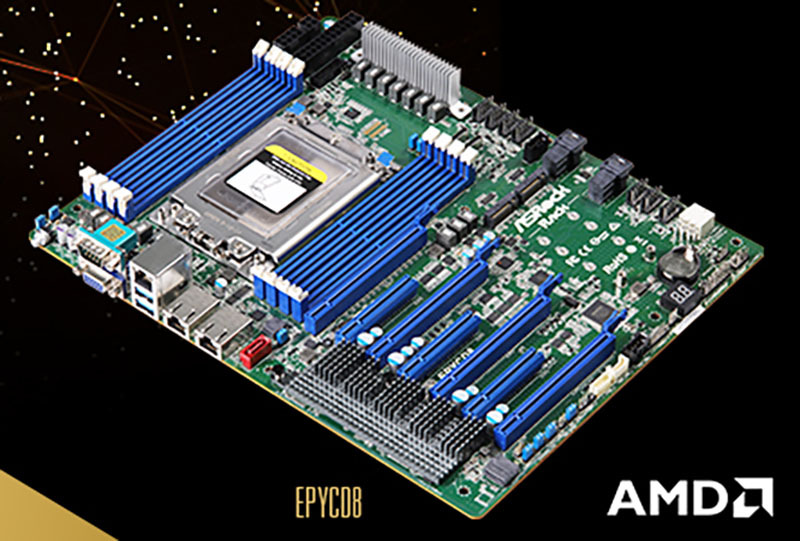 The ASRock Rack EPYCD8 is a single socket SP3 server motherboard for the AMD EPYC 7000 series. The layout is designed to absolutely maximize what this platform can be used with. There are a full 8x DDR4- channels and this motherboard can support the AMD EPYC “P” series single socket SKUs. That is important as it affords users an excellent value as we noted in our piece AMD EPYC’s Extraordinarily Aggressive Single Socket Mainstream Pricing. As you can see, the board has an awesome I/O array. There are seven PCIe slots. Four are PCIe 3.0 x16 and three are PCIe 3.0 x8 for a total of 88 of the 128 high speed I/O lanes exposed via PCIe expansion slot. One can also see dual M.2 slots that are M.2 22110 capable for PLP SSDs. Beyond that one can see two SFF-8643 for 8x SATA III and two slimline headers onboard. There is even a powered 7-pin SATA slot for SATADOM usage. Networking is only dual 1GbE via Intel i350. That is a premium gigabit NIC. We see an awesome configuration for this motherboard either utilizing all of the PCIe for NVMe storage or a 3x GPU plus 1x 100Gbps (EDR Infiniband or 100GbE) NIC. There are some who may be tempted to call this a workstation motherboard or wonder if it could be used as a workstation. Generally, we suggest not using EPYC as a primary workstation part, AMD Threadripper is better for the workstation market, and EPYC is considerably better for servers, even pedestal servers. The ASRock Rack EPYCD8 is setup for common rackmount and pedestal server front to back airflow given the DIMM and socket alignment. For those considering this as a workstation, there are no audio headers found on workstation platforms and only three USB 3.0 ports. 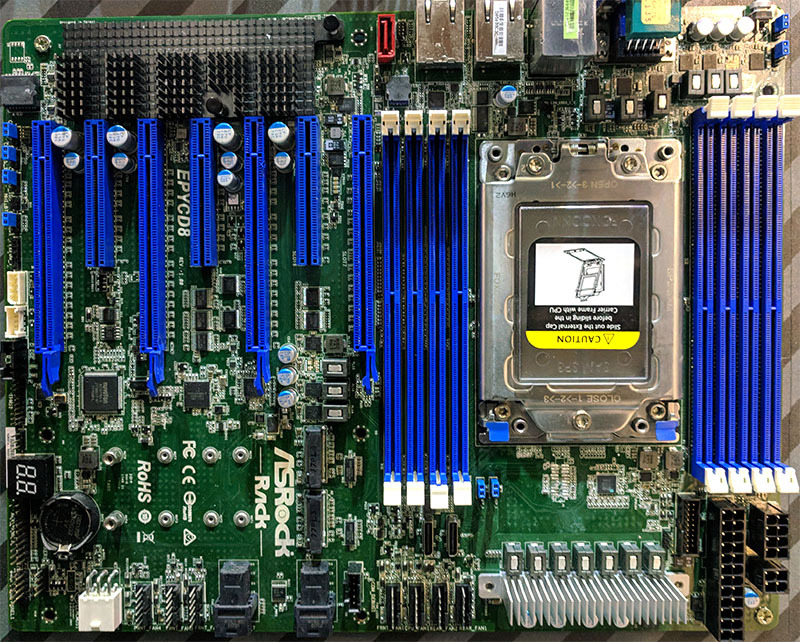 ASRock Rack has produced motherboards that have a similar layout and have some cross-functional features intended for the workstation market as we saw in our ASRock Rack EPC612D8A-TB Review. As a server motherboard, this is more than intriguing and one could convert it to a workstation motherboard with some add-in cards. Overall, we think ASRock Rack did an awesome job with this platform. The ASRock Rack EPYCD8 is exactly what we are hearing STH readers clamor for. An ATX form factor is what we call a “retail” form factor since it fits in an enormous amount of chassis. For those looking for a compact AMD EPYC platform that can utilize “P” series processors, this is one to look at when it is released. It still blows my mind that you can get 128 PCI-E lanes from a sub $1000, single socket CPU. Too used to Intel artificially limiting such things, I guess. ” Generally, we suggest not using EPYC as a primary workstation part, AMD Threadripper is better for the workstation market, and EPYC is considerably better for servers, even pedestal servers.” — this is very interesting remark since IIRC ThreadRipper supports only unregistered DIMMS hence is quite limited in max RAM supported size. Also TR seems to be more supported by game-boards developer hence their support for proper SECDED on ECC is questionable. I’ve not see server/workstation vendor board which would support TR. Honestly I’m a bit sick of AMD decision not supporting higher freq. on low-core count EPYC. I would surely appreciated 16 cores EPYC going >4GHz in turbo mode.